Not everything that I write about here will have to do with American history. From time to time I just like to share about things that I have read or heard that have impressed me deeply and which I think you might appreciate. Today is a case in point. The new school year is, for me, sort of like New Year’s Day functions for many Americans. I think of it as a time for new beginnings and a time to take stock of who I am and who I want to be. One of my goals for the coming year is to practice gratitude in a more self-conscious way. This is due in large part to a book that I read toward the end of the summer, Living into Community: Cultivating Practices that Sustain Us, by Christine Pohl. The first practice that Pohl highlights is the expression of gratitude, and much of what she had to say hit me right between the eyes. 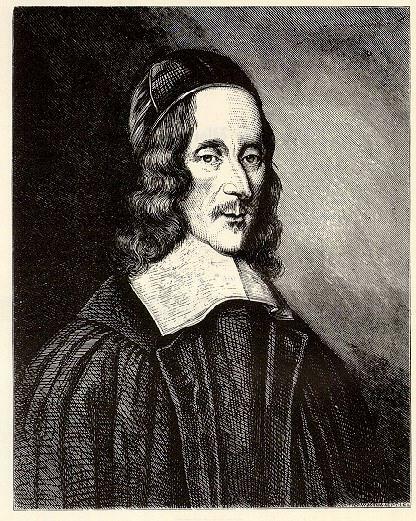 But first, a reminder about who George Herbert was. 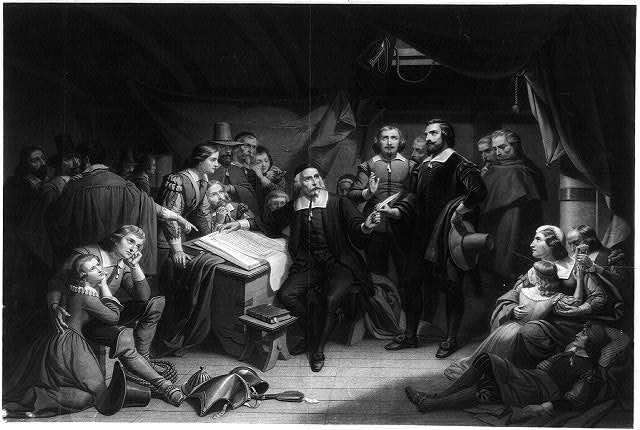 George Herbert was born at the end of the 16th century into a powerful English family. His father held the aristocratic title “Lord of Cherbury” and sat in Parliament. The son, who was educated at Cambridge and became a favorite of England’s King James I, seemed destined to a life of wealth, prestige, and political prominence before he decided to take orders as an Anglican priest in his mid-thirties. For three years he labored as a country parson in a tiny parish southwest of London, before succumbing to tuberculosis at the age of thirty-nine. “Gratefulness” is part of a collection of poems by Herbert that was published shortly after his death. I hope it speaks to you as it has to me. Give one thing more, a grateful heart. 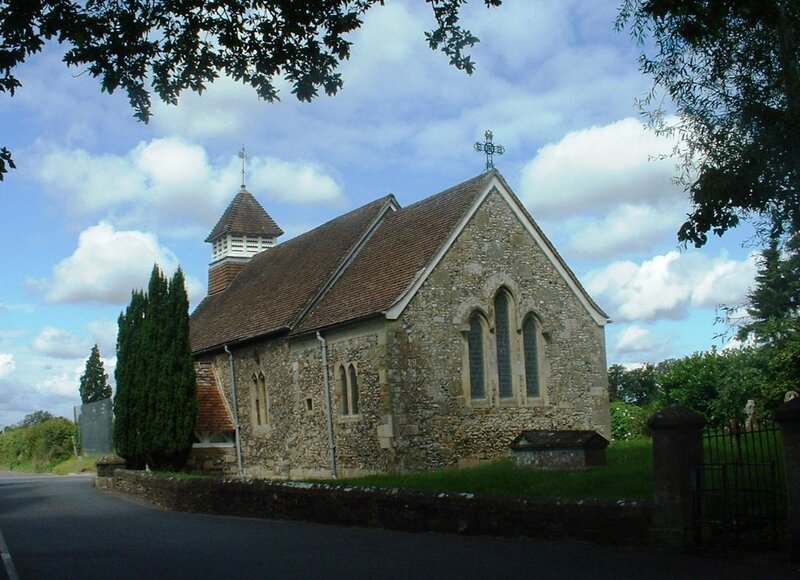 St. Andrew’s Church in Bemerton, Wiltshire, where George Herbert served as rector. This summer I read these books . . . Classes start tomorrow at Wheaton College, and I am mourning the passing of another summer. Don’t misunderstand me: I love to teach. I especially love teaching at Wheaton, where I am surrounded by wonderful colleagues, amazing students, and the daily opportunity to pursue the life of the mind within a framework of faith. But part of what I love about my job is that it also allows me to be a student again for three months out of every year, and I can’t help feeling wistful as these fleeting days come to a close. My original plan had been to spend much of the summer in Washington, D. C., conducting research at the National Archives for two book projects I would love to get going. Man proposes but God disposes, as the saying goes, and unexpected family needs dictated that I postpone the trip for another summer. I was disappointed at first, but never deeply, for the result is that I’ve had even more time for one of the things I enjoy most in the world, which is (drum roll, please) . 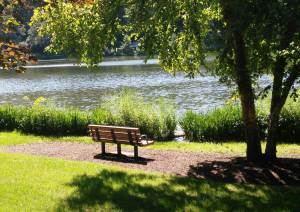 . . reading outdoors.
. . . here, at my favorite bench at Lake Ellyn Park, and . . .
Not very exciting, I know, but I can’t tell you how much these times feed my soul. I love to learn, and I love to teach, and my summertime reading is vital to both. 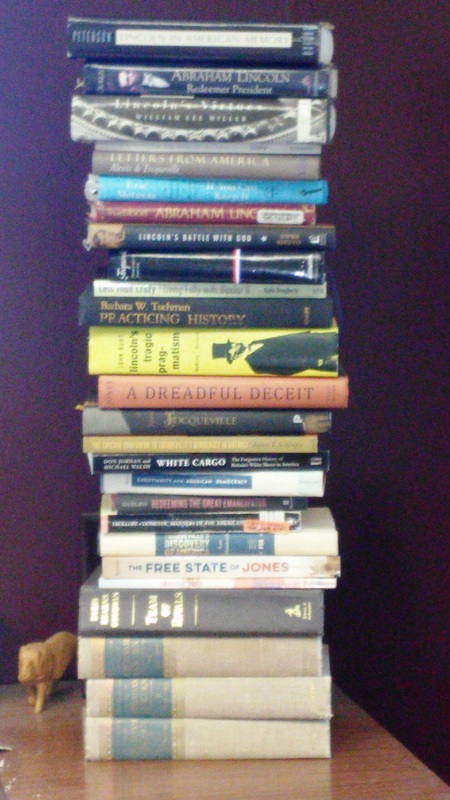 (Almost all of it pertains to classes that I will teach in the coming year.) But the physical setting is also important. I have enjoyed being outdoors in the summertime since I was a kid, but moving to the upper Midwest has multiplied my appreciation more than I could have imagined possible. 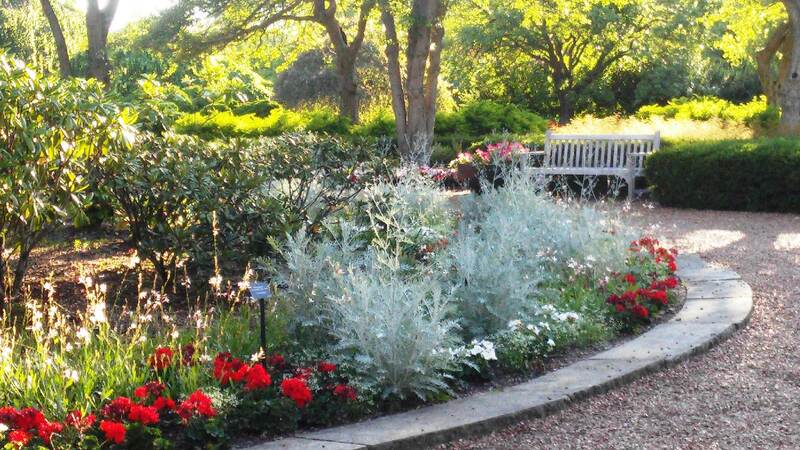 Reading a good book outdoors on a warm sunny day combines two pleasures that I’ve learned not to take for granted, and somehow that more than doubles them.
. . . here, at Cantigny Gardens, and . . . The settled happiness and security which we all desire, God withholds from us by the very nature of the world: but joy, pleasure, and merriment He has scattered broadcast. We are never safe, but we have plenty of fun, and some ecstasy. It is not hard to see why. The security we crave would teach us to rest our hearts in this world and oppose an obstacle to our return to God: a few moments of happy love, a landscape, a symphony, a merry meeting with friends, a bathe or a football match, have no such tendency. 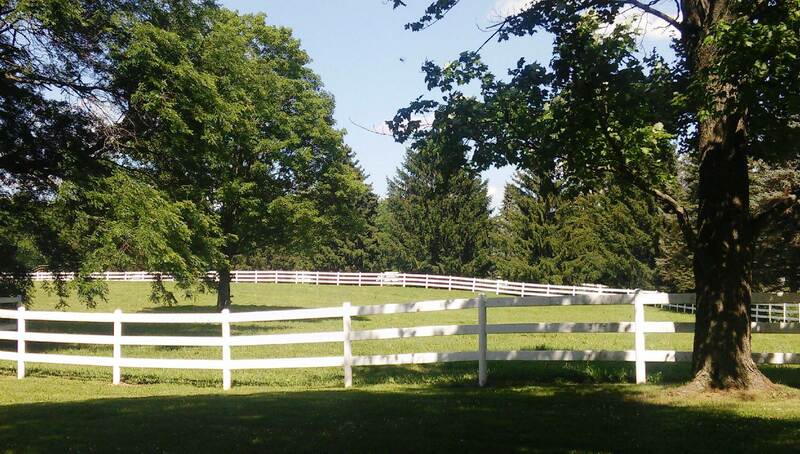 Our Father refreshes us on the journey with some pleasant inns, but will not encourage us to mistake them for home.
. . . here, at St. James Farm. This summer I’ve spent countless hours at Lake Ellyn Park, at Cantigny Gardens, and at my new Favorite Spot, nearby St. James Farm, a 600-acre former dairy and horse farm that was converted into a public forest preserve a few years ago. I’ve read a couple of dozen books there this summer, and most of the writing I’ve been able to do, such as it is, I’ve done at a picnic table near the old brick stables. I hate to say goodbye. In recent years the Lord has made it fairly easy for me not to “rest [my] heart in this world.” Chronic family illness and the resulting financial strains have become the new normal. And yet God has liberally sprinkled our path with “pleasant inns,” moments of refreshment that are foretastes of heaven. May God grant you many such inns along your journey as well. I’ve been making my way slowly through the Collected Works of Abraham Lincoln this summer, and yesterday I re-read a speech that I’ve known for years, only this time I read it against the backdrop of this year’s interminable presidential campaign and the schoolyard name-calling that passes for serious political debate in 2016. The speech is what is known as Lincoln’s “Cooper Union Address,” a talk that he made at a prominent lecture hall in New York City in February 1860, four months before the Illinois Republican received his party’s nomination for president. 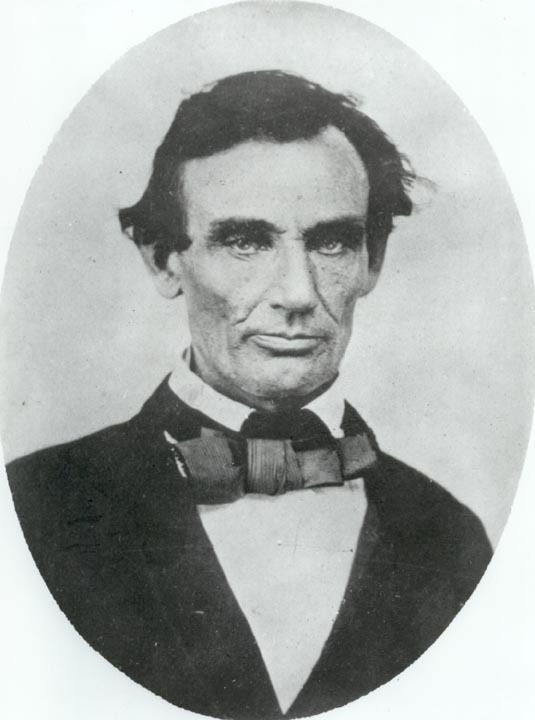 First, in speaking figuratively to white Southerners (there were few, if any, in the audience), Lincoln began with this acknowledgement: “I consider that in the general qualities of reason and justice you are not inferior to any people.” This echoed a familiar refrain in Lincoln’s speeches of the late 1850s, as he repeatedly, pointedly refused to characterize the southerners who vilified the Republican Party as either malevolent or misinformed. Almost no southerners heard these disclaimers, as Lincoln surely understood, but in making them, he was indirectly admonishing his northern followers to avoid self-righteousness. Lincoln was not arguing the moral equivalence of the two political factions. 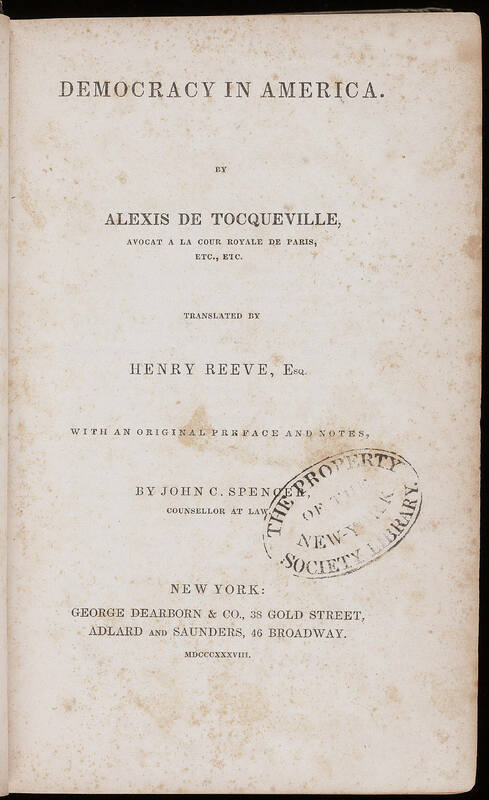 He made no bones about his belief that slavery was a “moral, social, and political wrong,” but he simultaneously refused to portray antislavery advocates as morally superior to slavery’s defenders. It is exceedingly desirable that all parts of this great Confederacy shall be at peace, and in harmony, with one another. Let us Republicans do our part to have it so. Even though much provoked, let us do nothing through passion and ill temper. 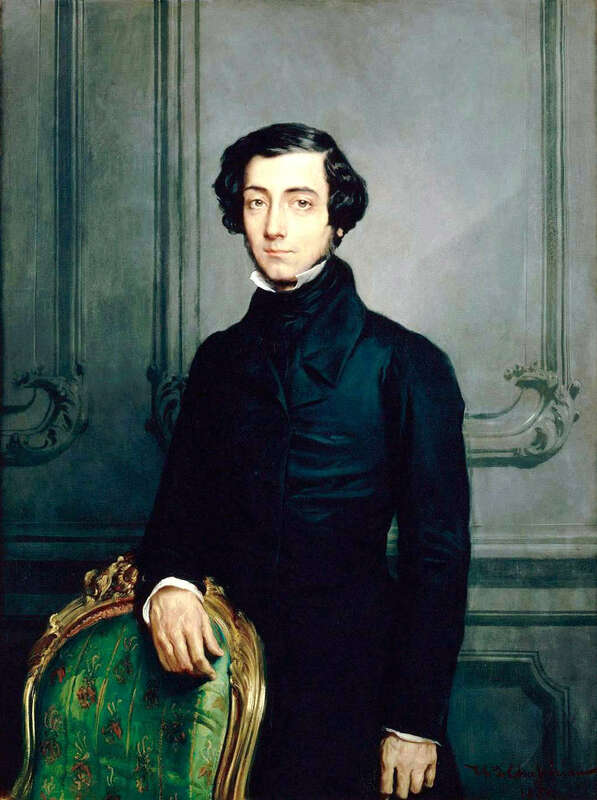 Even though the southern people will not so much as listen to us, let us calmly consider their demands, and yield to them if, in our deliberate view of our duty, we possibly can. 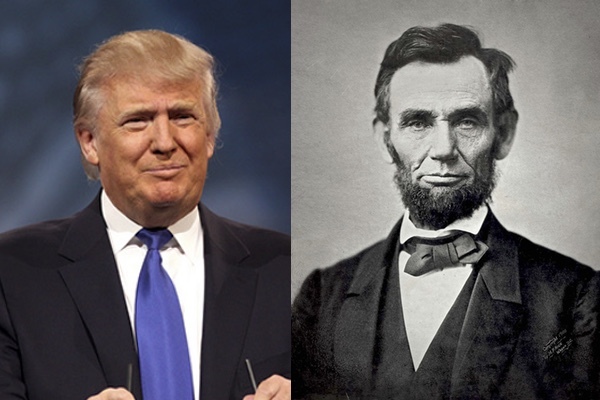 The current Republican nominee claims to admire Lincoln, explaining to Bob Woodward that Lincoln “did something that was a very important thing to do, and especially at that time,” whatever that means. What is more, Trump has touted his ability to be “as presidential” as Lincoln, or nearly so. Is it possible to imagine the current nominee following Lincoln’s example in either respect? In fairness to Trump, his caustic, defamatory, polarizing anti-intellectual rhetoric is but an extreme example of the general tenor of partisan debate in our time. Each party portrays the other as a combination of evil leaders and stupid followers. What is destroyed in these characterizations is the possibility of what political scientists call “persuasive engagement,” the potential for rational argument in which each side respects the other and can conceive of some sort of compromise in which both sides benefit. 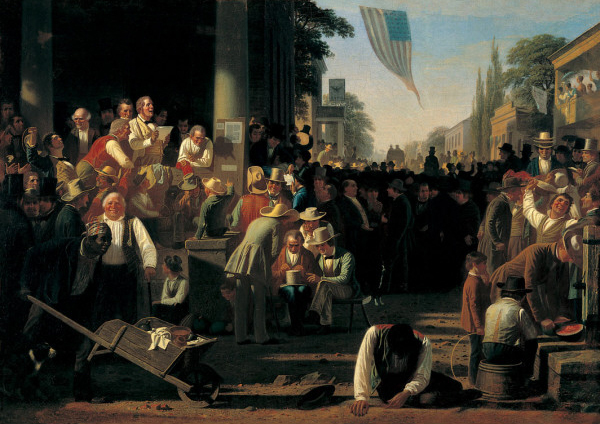 One hundred and fifty-six years ago, Lincoln implored his southern critics to be open to persuasive engagement. Let the battle be over principles, not personalities, he exhorted them. 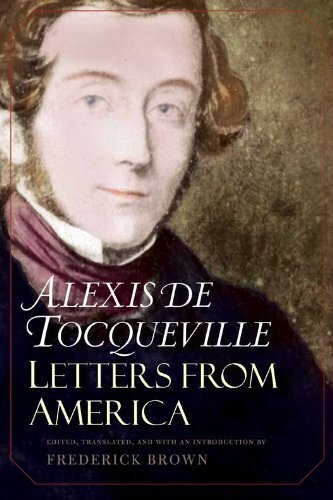 Above all, “meet us as if it were possible that something may be said on our side.” The first step to constructive political dialogue, in other words, is humility, a willingness to acknowledge that no single party has a monopoly on wisdom and virtue. Not bad advice. 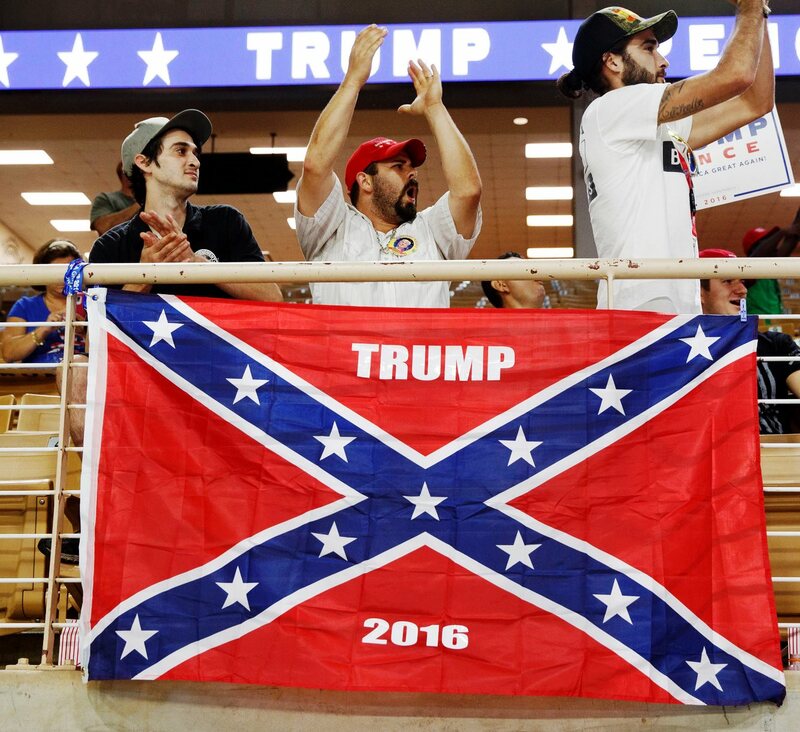 There was a brief flap at a Donald Trump rally in Kissimmee, Florida on Thursday when a Trump supporter displayed a huge Confederate battle flag near the speaker’s platform. Similar flags, emblazoned conspicuously with “TRUMP 2016,” were for sale in the parking lot outside Kissimmee’s Silver Spurs arena, but Trump campaign officials evidently blanched at it being hung almost within spitting distance of the stage. The flag’s owner, a twenty-seven-year-old Trump supporter from Deland, Florida, grudgingly agreed to remove the flag but refused to believe that Trump himself would have objected to it. The real culprit was the media, which is evidently controlled by Yankees. It kind of upsets me a little bit, but because of the dishonest media, which he [Trump] talks about, because of that, it forces them and ties their hands to do certain things so that the media doesn’t take something and spin it and turns it into something that it’s not. Erring on the side of caution, in other words, the Trump staffers decided to remove the rebel flag lest the media try to sensationalize the incident and turn the flag into some sort of controversial symbol. How dishonest! In case you’re interested, I’ve written at considerable length about the historical arguments both for and against the Confederate battle flag. You can find them here, here, here, here, and here.